According to documents obtained by the Guardian, Verizon signed an agreement last year with Nasa “to jointly explore whether cell towers … could support communications and surveillance of unmanned aerial systems (UAS) at low altitudes”. That $500,000 project is now underway at Nasa’s Ames Research Center in the heart of Silicon Valley. Nasa is planning the first tests of an air traffic control system for drones there this summer, with Verizon scheduled to introduce a concept for using cell coverage for data, navigation, surveillance and tracking of drones by 2017. The phone company is scheduled to finalise its concept by 2019. Nasa’s new UAS (unmanned aircraft system) traffic management operation is intended to enable safe low-altitude drone flights within the next four years. At the moment, there is little to stop operators flying wherever they want. 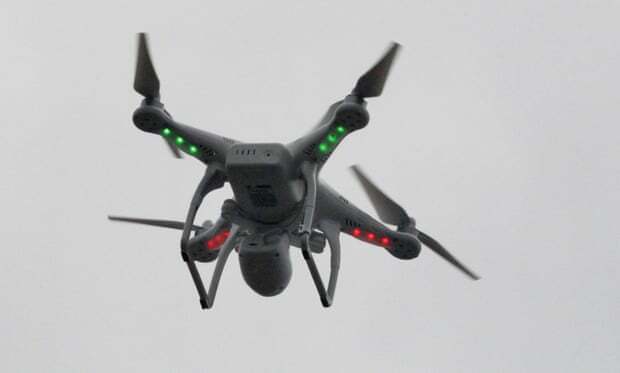 The agency would like technology that will automatically “geo-fence” drones to keep them away from sensitive areas like the White House, ground drones in bad weather, help them to avoid buildings and each other while flying and decide which drones have priority in congested airspaces.